Trucks wait in the queue for border customs control to cross into U.S. at the Bridge of Americas in Ciudad Juarez, Mexico, August 15, 2017. A deal on a new North American Free Trade Agreement is close at hand but talks to arrive at a finishing point are not easy, top Mexican officials said on Thursday as ministers met in Washington for a third successive day. Negotiators from the United States, Mexico and Canada have been working relentlessly for weeks to clinch a deal, but major differences remain on contentious topics such as autos content. Complicating matters, the Trump administration has threatened to impose sanctions on Canadian and Mexican steel and aluminum on May 1 if not enough progress has been made on NAFTA. President Donald Trump, who came into office in January 2017 decrying NAFTA and other international trade deals as unfair to the United States, has repeatedly threatened to walk away from the agreement with Canada and Mexico, which took effect in 1994. “I think we are reasonably close. Certainly this has been a very good week,” said Mexico’s Foreign Minister Luis Videgaray. He said talks would resume on Friday morning. Still, much remains to be done before a new NAFTA deal is reached. Now underway for eight months, the talks to revamp the accord underpinning $1.2 trillion in trade entered a more intensive phase after the last formal round of negotiations ended in March with ministers vowing to push for a deal. Although Washington is keen for an agreement soon to avoid clashing with a July 1 Mexican presidential election, the three NAFTA members remain locked in talks to agree on new rules governing minimum content requirements for the auto industry. Still, Canadian Foreign Minister Chrystia Freeland rejected the notion that discussion of the so-called rules of origin for the automotive sector was holding up the process. Freeland said she would skip a planned visit to a NATO summit in Brussels on Friday, and vowed to stay in Washington for “as long as it takes.” Guajardo, too, said he was ready to remain in Washington this week for more talks. The three sides are also trying to settle disagreements over U.S. demands to change how trade disputes are handled, to restrict access to agricultural markets and to include a clause that would allow a country to quit NAFTA after five years. Bosco de la Vega, head of Mexico’s National Agricultural Council, the main farm lobby, said he believed the three would be able to reach an agreement on agricultural access. But the auto sector rules were still contentious, he added. “It’s the most important issue there,” he said, adding that he had earmarked May 10 as the deadline for a quick deal. U.S. negotiators initially demanded that North American-built vehicles contain 85 percent content made in NAFTA countries by value, up from 62.5 percent now. But industry officials say that has been cut to 75 percent, with certain components coming from areas that pay higher wages. “The United States initially floated proposals on $15/$16 an hour, total content of the car assembly at about 30 percent of the cost of the car. Now they are talking about increasing the 30 percent,” Jerry Dias, president of Unifor, the largest Canadian private-sector union, said of the proposal to build certain parts in higher wage areas. Earlier on Thursday, a group of Democratic U.S. congressmen said they were frustrated with a lack of information from USTR about the trade negotiations and said this could cost Trump support for a NAFTA deal. “If their strategy is based upon not sharing what is happening with negotiations ... I would suggest that their tactics are wrong and they shouldn’t take any votes for granted,” said Representative Rick Larsen of Washington state. Larsen, whose district includes Boeing Co’s largest commercial aircraft plant a massive source of U.S. exports, is a member of the New Democrat Coalition, a group of 68 centrist Democrats that are seen as crucial for passing trade deals. 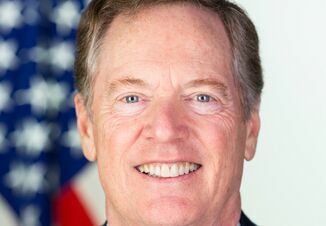 Lighthizer had been scheduled to meet with the group on Thursday but canceled because of the intensified NAFTA talks. Will Grilling Season Fire Up Hog Prices?